A summer spent dealing with health issues really takes its toll in wasted time sitting around waiting to heal, or sitting around waiting on doctors’ appointments. As I started feeling better, I took on a few odd jobs, and this was one. 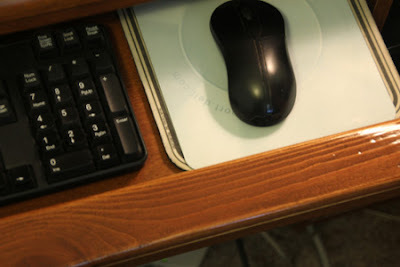 The little elevated edge added to keyboard surfaces looks simple enough, but has the very important job of helping to avoid carpal tunnel syndrome and hand and wrist arthritis. It does this by helping to maintain a neutral or zero-degree angle between hand and keyboard. As with most modern furniture, however, little is intended for long-term use when materials like plastic and hardboard are used for building materials. On our computer desk, the vinyl cover had worn through. That exposed the underlying hardboard and the contact adhesive used to bond the vinyl cover. Some wide plastic electrical tape kept us from the constant irritation of sticking to the adhesive, but this was a passing and very temporary way of dealing with the problem. Once I got back in the shop, I measured the angles needed to duplicate the original piece, created a replacement out of fir, stained it mahogany to match the desk, and finished with several coats of varnish. 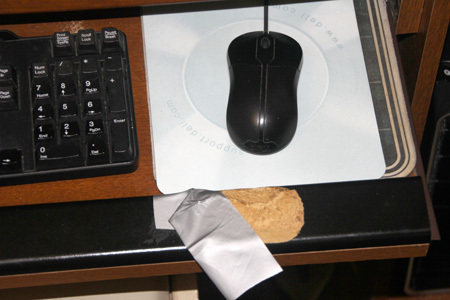 The original hand rest had been attached to the deck with two-sided sticky tape, another concession to cheap construction. With that removed, the new replacement was properly affixed to the keyboard surface with concealed screws inserted from below. It was a simple job that looks nice, and has paid high dividends.